What if for some reason, your Facebook Business page was shut down? Facebook can shut down a page without notice and at any time and this has happened to pages that have 1000′s of followers. Imagine, all that hard work in building your following, all that time taken to create engaging content is lost; your audience, back to zero… Read on to ensure this doesn’t happen to you! One of the main aims for a Facebook page is to build your following, thus your customer database, which will include current and new customers. What happens if your page gets shut down? You can’t get in touch with them if you don’t have another way of contacting them! Collecting your followers contact details such as an Email address would ensure that if your page is shut down, you can still get in touch with your followers. 1. Invite Facebook followers to sign up to your E-Newsletter (MailChimp), E-book or competition, are all great ways to collect contact details. 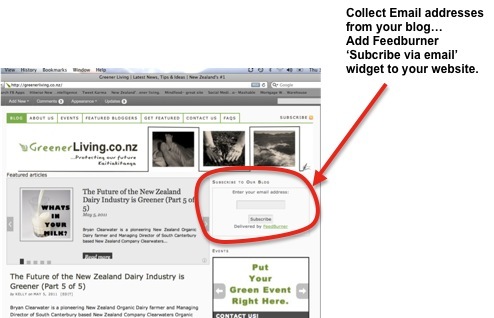 You can also collect Email addresses from your blog via Feedburner’s the ‘Email subscription’ widget. 2. Make sure you promote your sign-up. For example a berry company might have a weekly E-newsletter and an E-book with berry recipes, which they can promote on their company website and through Facebook. They could also run a competition (by themselves or through a third party app like Wildfire App). 3. Hackers will target Facebook and other social networking to harvest information about you. Here’s a few tips to set your Facebook privacy options to protect against online identity theft. 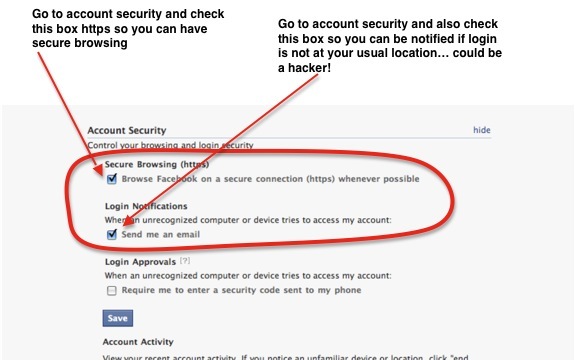 You can change your account security settings on your Facebook page. You will find the ‘Account Security’ setting in the top right corner under ‘Account’/ ‘Account settings’. If you get any suspicious links/videos/photos posted on your personal profile wall, do not click on the link. Delete the post from your wall. (You can also click the Report as spam button too). 1) Run your computer’s virus checker. 2) Clear your cache (and possibly cookies too). 3) Switch to https:// secure browsing mode (see screenshot). This significantly lowers your risk of being hacked, but you may find some content is not viewable on Facebook and you’ll have to switch in and out of secure mode. 4) Change your Facebook password to something longer and more cryptic. 5) Log out and back in again. Whoever is admin of your business page should follow these steps to help prevent their account getting hacked and thus your business page. In Summary then, as part of our social media strategy we must collect contact details of our followers via sign-ups (E-book, Newsletter, Comp) to protect our Facebook asset. We also need to ensure all page admins take those few simple steps above in order to protect the business page against hackers. If you have any other tips you think should be included here, please let us know in the comments box below.